Saturday was spent in Kona with Stacy and the kids. We hit up Costco and I was able to pick a few last-minute things up on Ali’i Drive. I had my last guitar lesson in the evening, which was sad. It’s tough when you find an instructor you like with a style you like, and you can’t continue. Mine was awesome though – we’re going to keep in touch so that if I have questions or get stuck on anything or just need help, I have someone to ask. Also, as he pointed out, I’m obviously going to return to Hawaii at some point (I hope!) so we can always pick things up again then. I spent the evening doing laundry and just crossing things off my list of things to accomplish before I leave. Leilani spent the evening drawing pictures for my brothers, which was really cute. She is amazingly artistic – I am always surprised by the things she creates and the way she does it differently from how everyone else would. Today (or I guess it was yesterday) was a really long day. I woke up around 8AM and hung out around the house, packing and getting ready for the beach at the same time. Leilani, La’a and I had a bit of a bunny photo shoot at one point, but the pictures are on Stacy’s camera so I don’t have them right now. Sean was off today as well so we all had plans to spend the day at the beach. Eventually we were all ready and I was all packed. We hopped into the truck and went to Hapuna Beach. As you may or may not recall, this was the beach I spent my very first beach day in Hawaii at, so it was a fitting place to end. Despite the fact that the weather wasn’t perfect, we all had a great afternoon at the beach. 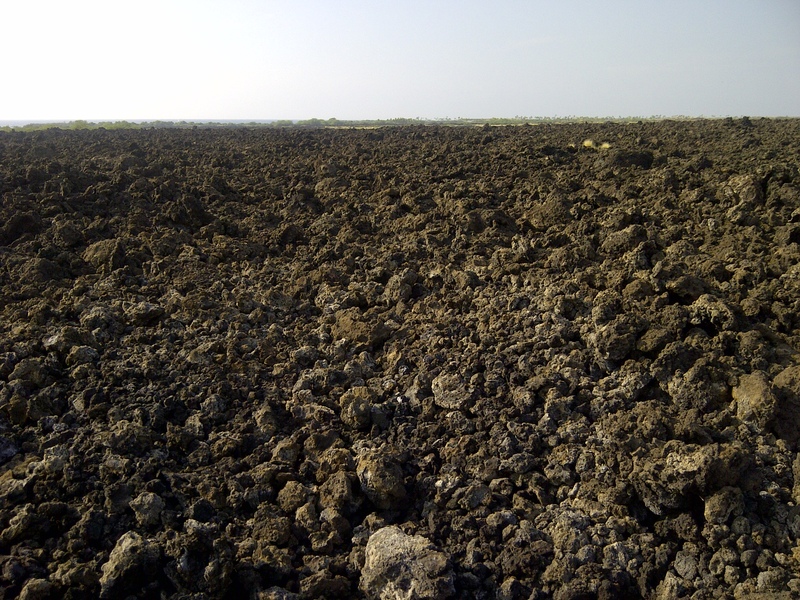 I’m pretty sure La’akea was the happiest kid in North America when he found a giant mud pit to play in and got himself covered in muddy sand from head to toe. 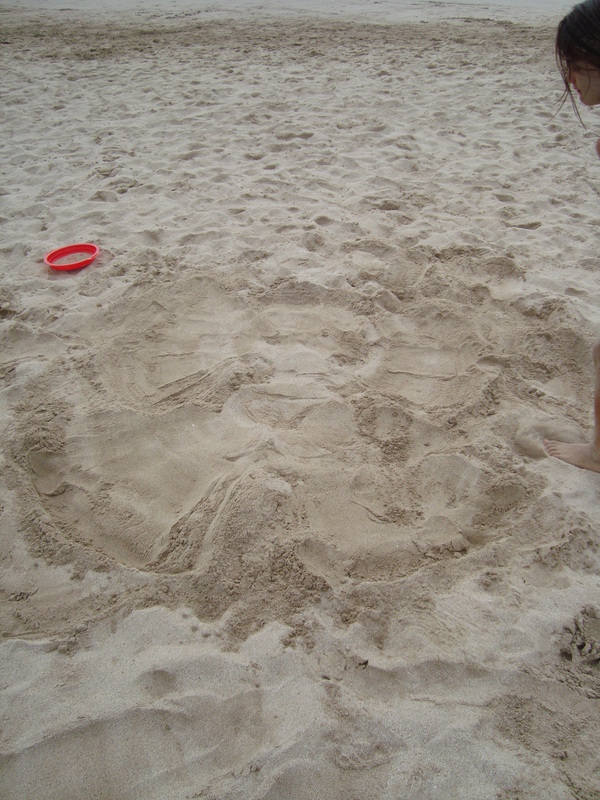 Leilani made a bunch of sand angels, which I thought was pretty cute. 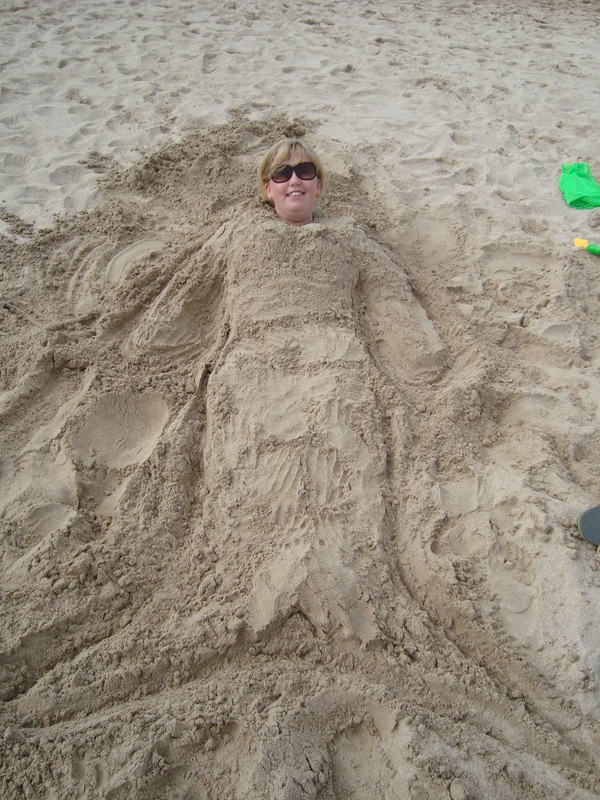 It’s just like you would make a snow angel… but in sand! Sean grilled fish he had recently caught on a fire at the beach and made sandwiches for us for lunch. I don’t know if I’ve mentioned this yet for the benefit of those of you that don’t already know, but Sean is a chef. I’m definitely going to miss living with a chef. We got the star treatment for sure. I sometimes felt like I was eating at a restaurant with the food he would make. Which isn’t surprising since he does work at a restaurant. Obviously. Sadly, it’ll be back to eating like a poor student again soon enough. Even though I’m not a student any more, I’m still poor… so that makes this necessary. 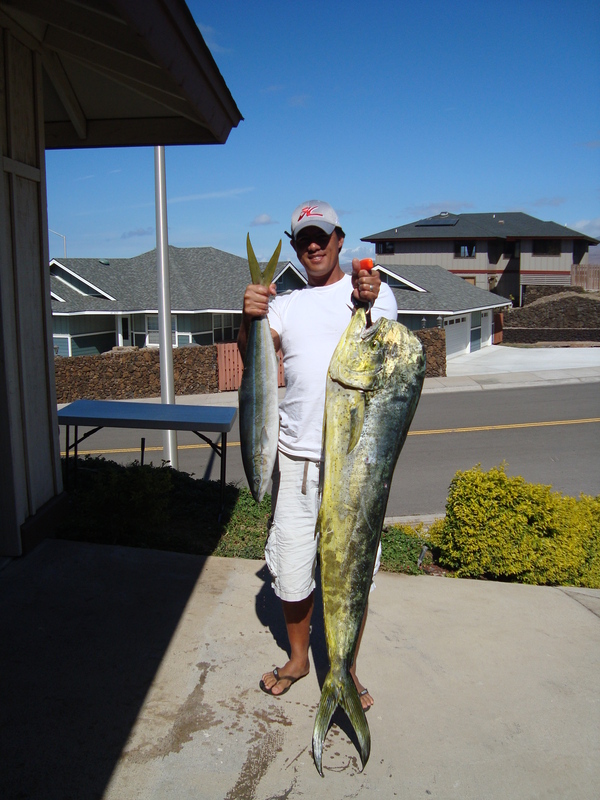 The fish Sean caught last week, which we have been eating recently. Eventually it was time to head back to the house. I showered, packed the rest of my stuff up, ate my last chef-prepared dinner, said goodbye to the kids to Stacy, and hopped in the car with Sean to head to the airport. And that brings me up to now. It’s 3:50 in the morning for me right now, Hawaiian time. I’m on the airplane, landing in Vancouver soon I think. I was able to sleep for a bit as my flight isn’t too full. I have a whole row of seats to myself. I popped my headphones in, blew up my airplane pillow, and covered myself in the jacket Stacy gave me since she doesn’t use it in Hawaii, and was able to actually fall asleep. I’m excited to be back in Canada for many reasons, but I’ll also miss many things about Hawaii. – The little reflectors on all the roads… they are amazing! They make street lights absolutely unnecessary. – My bunnies, especially the poor little renegade bunny. – SNOW! I don’t think it’s really sunk in that it’s Christmas yet, but I’m excited to feel festive. – My dog. I’ll get to see him for a few days in Kelowna. – I can’t wait to quit living out of a suitcase. – I am excited to return to my own guitar and start to practice on it. – My friends, of course… as much as I was surrounded by many people in Hawaii, I rarely hung out with anyone around my age. – Winter clothing. I know this sounds silly, but I’m excited to get all bundled up against the elements. – Hockey coverage! I’m tired of endlessly watching NHL on the Fly, hoping that they choose to cut to the game I want to see at some point. 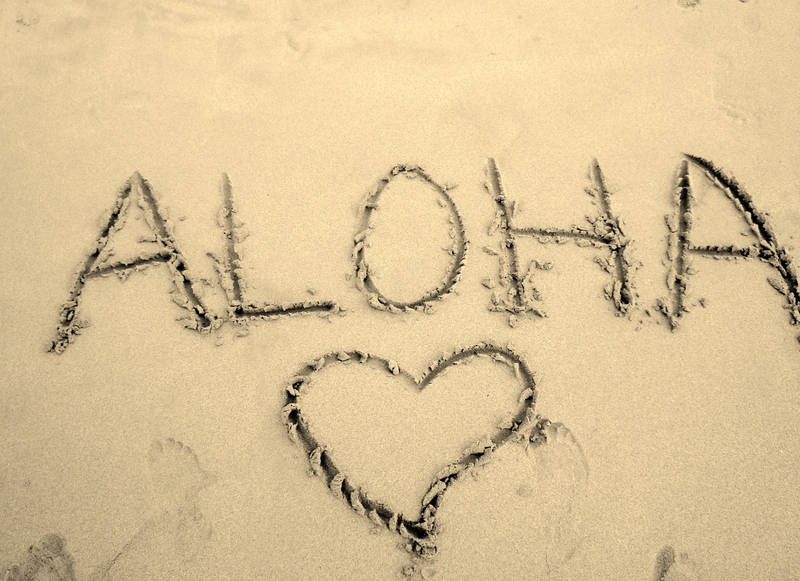 I’ve loved so many things about my time in Hawaii, and I’ve got a bunch of things I want to do when I return. I really was able to do so much this trip, and got to see so much of the island, but I just feel like there is so much more out there. – More hiking. 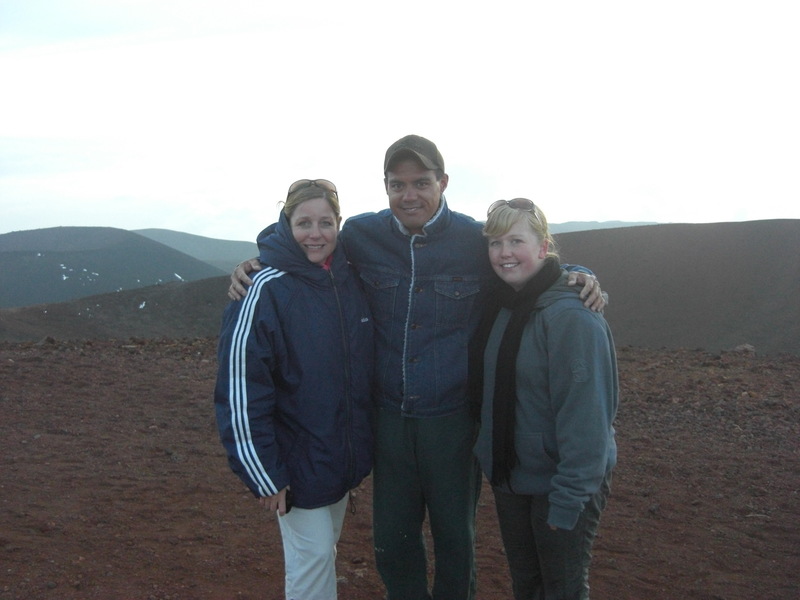 Maybe at the Volcano or in Waipio Valley? I am so happy that I was able to just take this time off and spend it with my Hawaiian family. I only hope that it isn’t too long before I can go back. It’s sad to think that the kids will probably have grown up so much by the time I get to see them again, but at least I got to know them a little bit now. 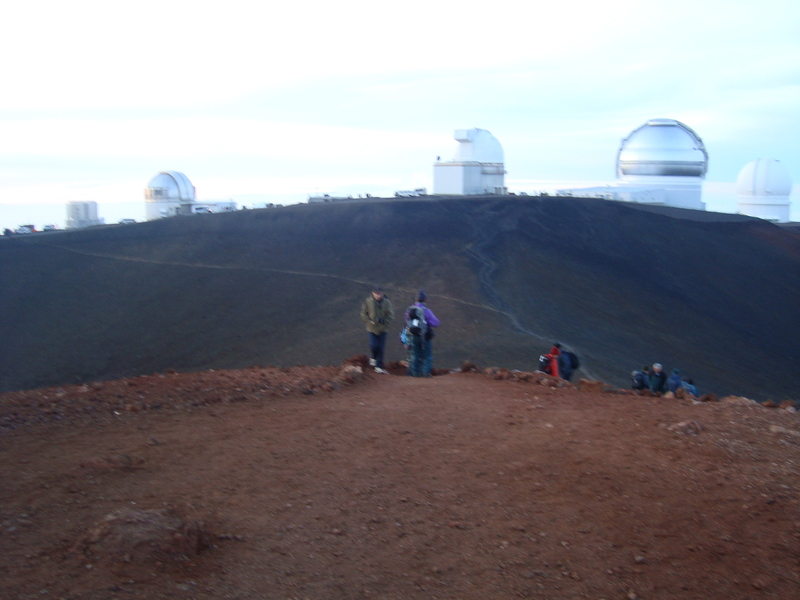 On Friday, Stacy and I had plans to go up Mauna Kea. We had invited Rhinehart to join us as well… partially because we wanted to hang out with him and thought he would enjoy it, and also partially so he could drive the vehicle for us. We spent the day casually hanging out at the house, until around 3 PM. Rhinehart met us then, and we all hopped into the Jeep we had rented for this trip. 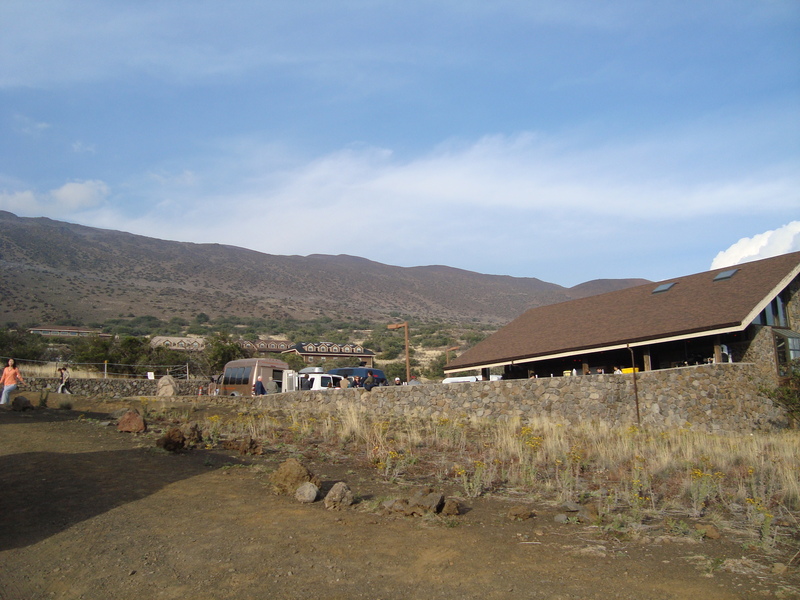 We made our way up to the Visitor Information Center at the 9000-ft level. Here we stopped to acclimatize for a half hour or so, and also to check out the gift shop and a short informational video. We then ate the pea soup we had brought up with us, and all tried a bit of Rhinehart’s dehydrated spaghetti. Weird. Eventually it was time to head up to the summit. We all hopped into the vehicle to drive up. I’m not sure if I’ve mentioned this before, but I’ve thought about it many times. The Hawaiian night sky is absolutely beautiful, even just from Waikoloa. The stars are brighter than I’m used to, and probably brighter than almost anywhere on the planet. 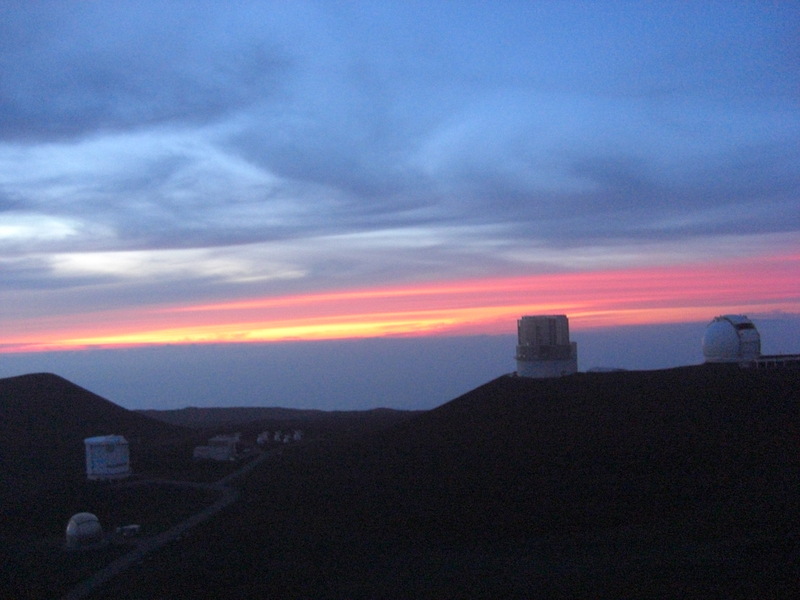 The Hawaiian Islands in fact have restrictions on street lamps and many other types of lighting in order to keep light pollution down and preserve the Hawaiian night sky at its best. This sky and the brightness of the stars is definitely something I will miss when I head back to Canada. It took about a half hour on a bit of a sketchy road to make it to the top. Stacy says that this is the only road in Hawaii that she gets scared on. I could see why, though for some reason I didn’t feel the same fear she did. At the top, we parked the car and hopped out. 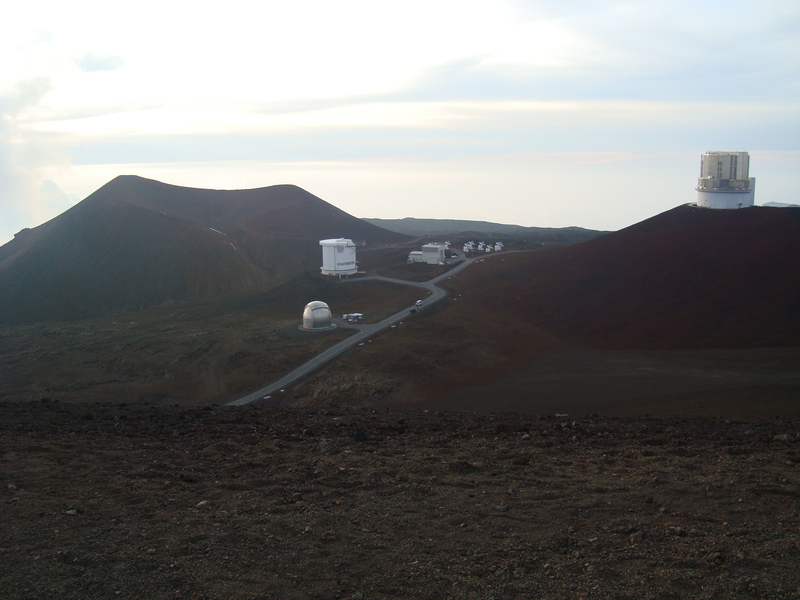 We all decided that many movies set on the moon or Mars could easily have been filmed on top of Mauna Kea. We wandered around a little bit, but found that we all got lightheaded extremely quickly so tried not to exert ourselves too much. We did end up doing a very short hike to the true summit. We took it very slowly but still felt a little lightheaded. I can’t imagine actually climbing mountains like Everest and exerting yourself like that on a daily basis. Up on the very top, there were a bunch of offerings for the Hawaiian gods. It was an amazing spot for something like that. For those of you who have been following my blog, and wondering about the mysterious Rhinehart… this is him. After taking a few more pictures, we hiked back down to the Jeep and watched the sunset from there. Before long, it was dark. 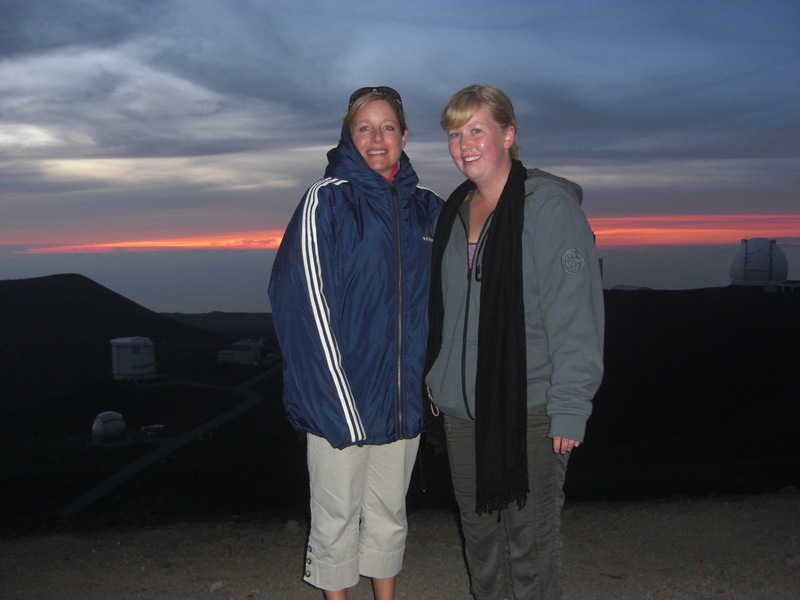 We got back into the vehicle and went back down to the Visitor Centre to do a little stargazing. 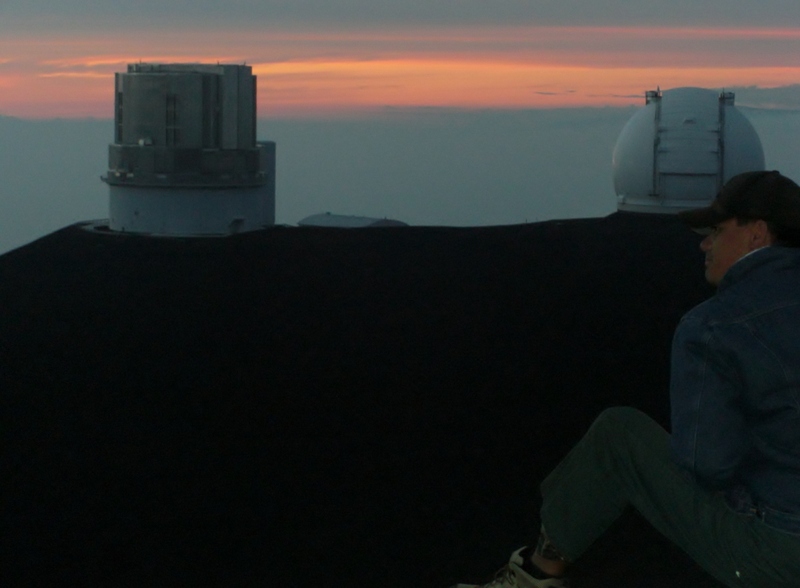 We watched a short video about Mauna Kea’s observatories, and looked through a few telescopes. It was a pretty neat experience to gaze at the moon and be able to see its craters, or to see all four of Jupiter’s moons. Eventually it was time to head home and pick up the kids. Despite the fact that our adventure wasn’t overly strenuous or long, we all felt exhausted afterwards. We spent the rest of the evening watching Country Strong, and Stacy and I even convinced Rhinehart to join us for that. My favourite thing about today was seeing the Hawaiian night sky from an even more beautiful vantage point. Stacy, La’a, and I hiked Pololu Valley on Thursday. It was an absolutely perfect day to do this trip! La’a got very excited about hiking in the morning and dressed up in all his safari gear. It was adorable. 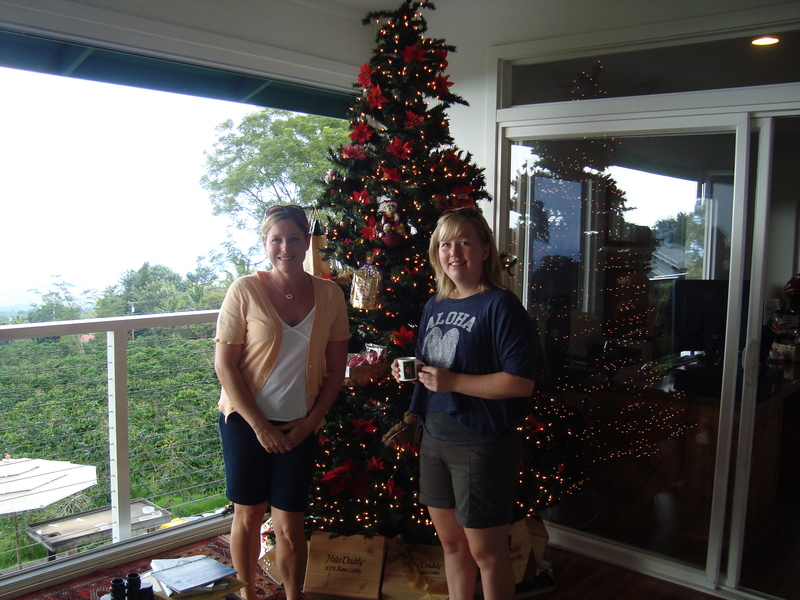 We started off by heading to Waimea where Stacy had a morning appointment. La’a and I went to Starbucks to sit for a bit while we were waiting for her. 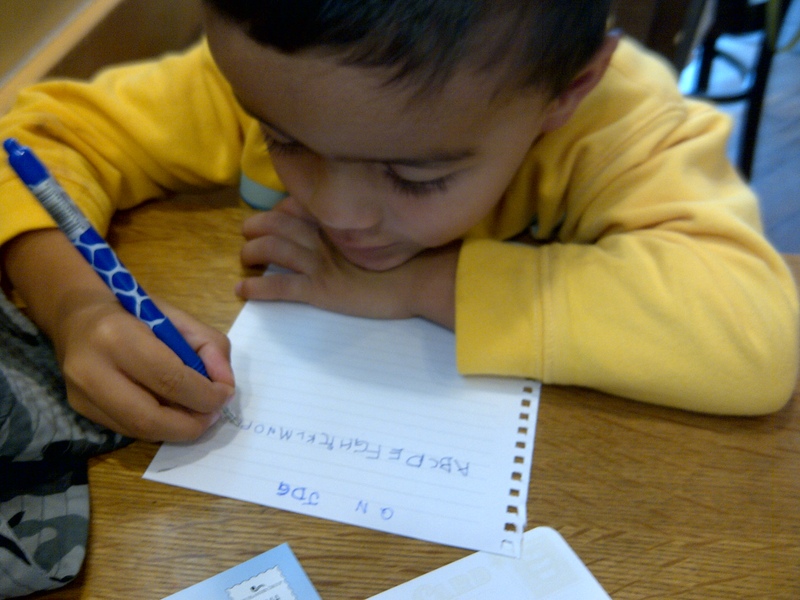 He practiced his alphabet while I wrote a few postcards. After that, we drove the upper road from Waimea to Kohala, and made our way towards Pololu. The valley was beautiful. I was very excited to be heading down the hill this time instead of just looking from the top. We hiked down to the bottom – it only took 15 minutes or so, even with a 4-year-old in tow – and hung out down there for a while. We then made the trek back up. 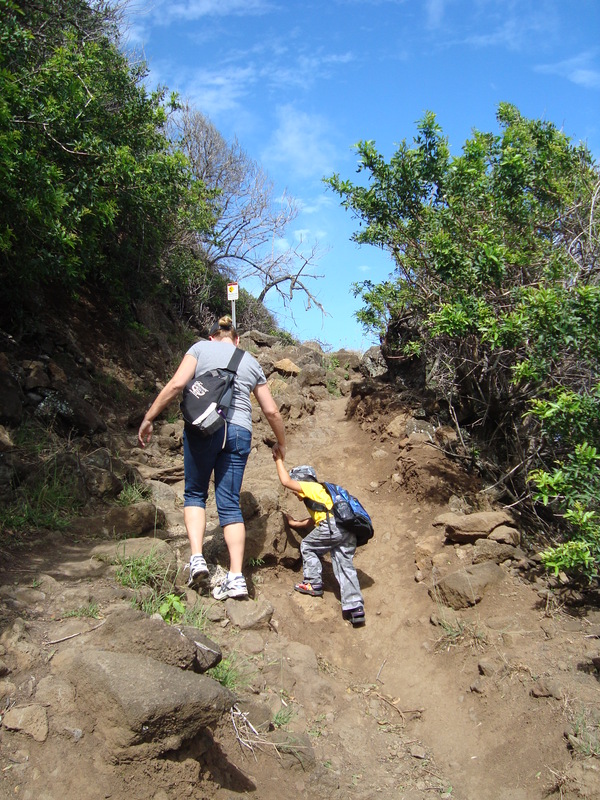 La’a did so well – I think Stacy only had to carry him for one stretch of a few minutes on the way up. 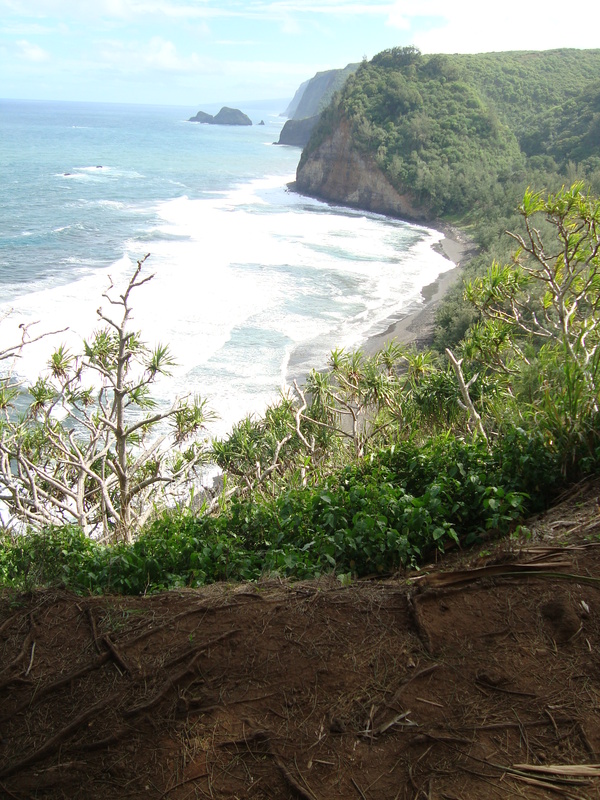 So a note to everyone else out there: 4-year-olds can totally hike Pololu. And everyone they walk past is extremely impressed that they are doing it, especially when their backpack is full of rocks that they want to bring home. 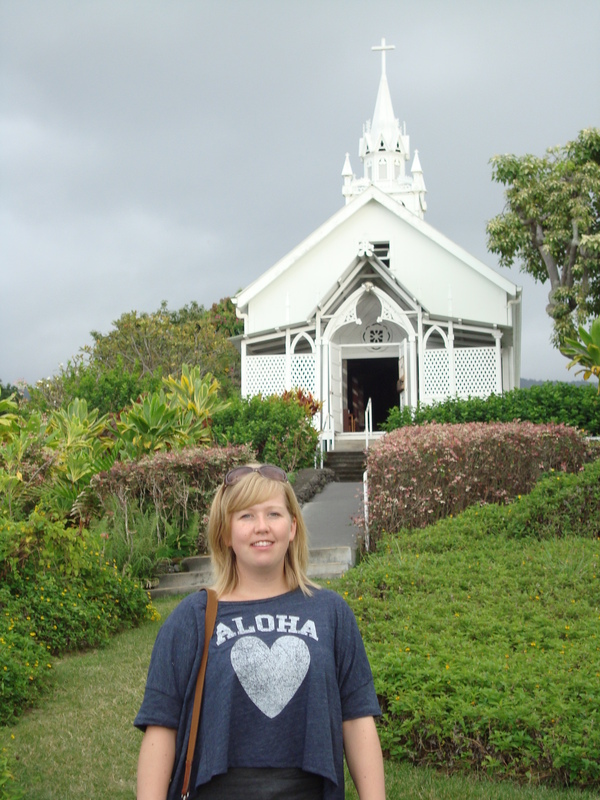 Next, we had lunch in Hawi, did a little shopping, and again got the most heavenly coconut ice cream on Earth. 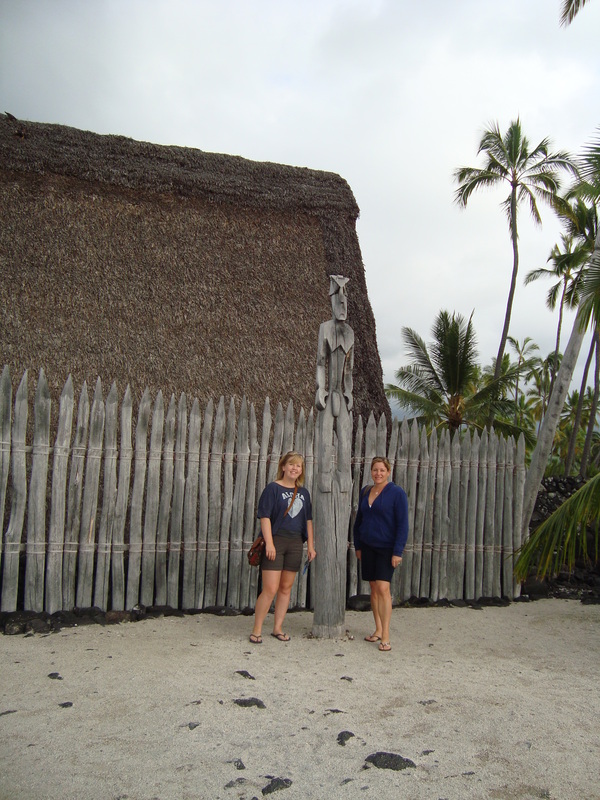 By that time, we had to head back to Waikoloa to pick Leilani up. We spent the evening watching Mulan and relaxing. Wednesday was a mellow day to get things done around the house, which definitely necessary at this point. On Thursday Stacy and I went golfing at the Waikoloa Village course. 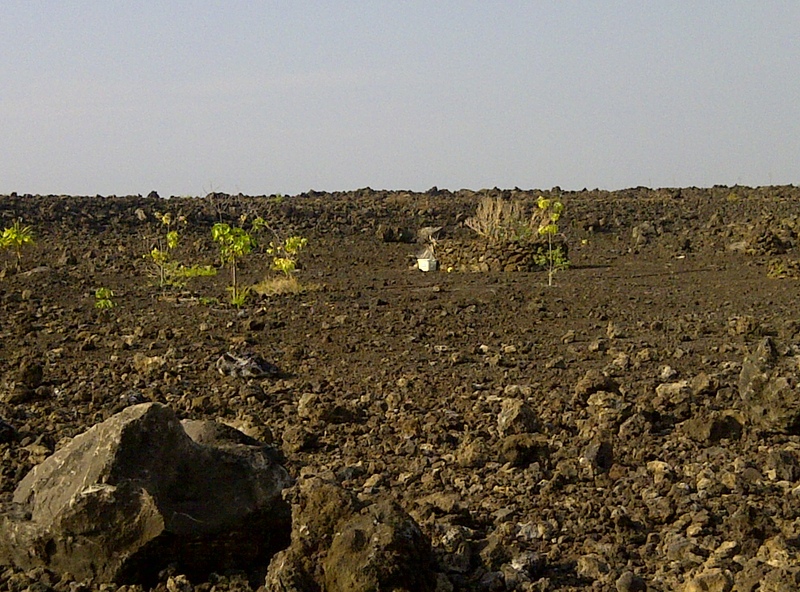 We had probably a perfect day for that as well – the gale force winds of Waikoloa weren’t in force and a nice cool breeze had replaced them. We had a good morning on the golf course, even though Stacy hadn’t been out in ages. We did manage to get lost near the end and played a couple holes twice. We’re still not sure exactly what happened, but it was ridiculous. That night, a couple came over to check out our bunnies. We already had a home lined up for one of them, but were really hoping to find another home for the pair that had been together the whole time. As it turned out, this couple wanted to take two of them! They’re waiting to pick them up as a Christmas surprise, but we were quite happy to find a good place for them to go. It looks like little renegade bunny will be heading to the other home Stacy had set up, as the other two already seem bonded. 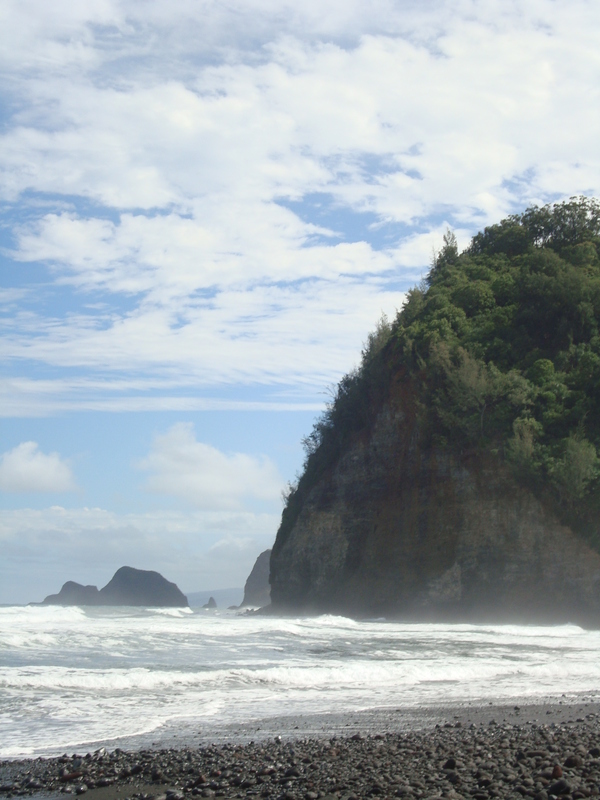 My favourite thing in this blog post was definitely hiking Pololu. It was a perfect day. Today Stacy and I took on another super-touristy day, much like the day we did Green Sand Beach and Volcano all at once a few weeks ago. A lot of people might not be up for such strict schedules, but we love packing our days full of everything we possibly can. Today also happened to be a highly educational day… who doesn’t love learning? Around 9AM, we climbed into the car and went toward Kona. 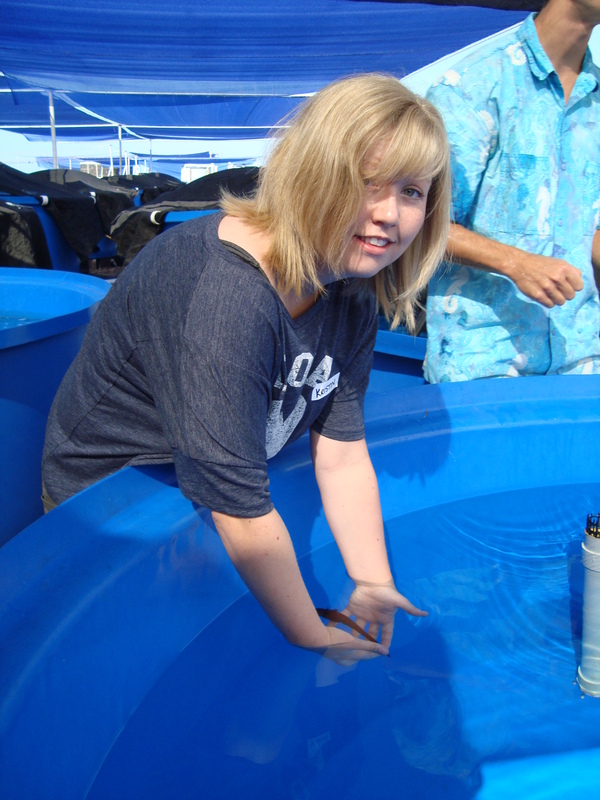 Our first stop of the day was the Ocean Rider Seahorse Farm for a tour. Check out www.seahorse.com if you are interested in this awesome organization. Ocean Rider is a small “Mom-and-Pop” type of farm – it just happens that they farm seahorses instead of crops or other animals as you would usually expect. 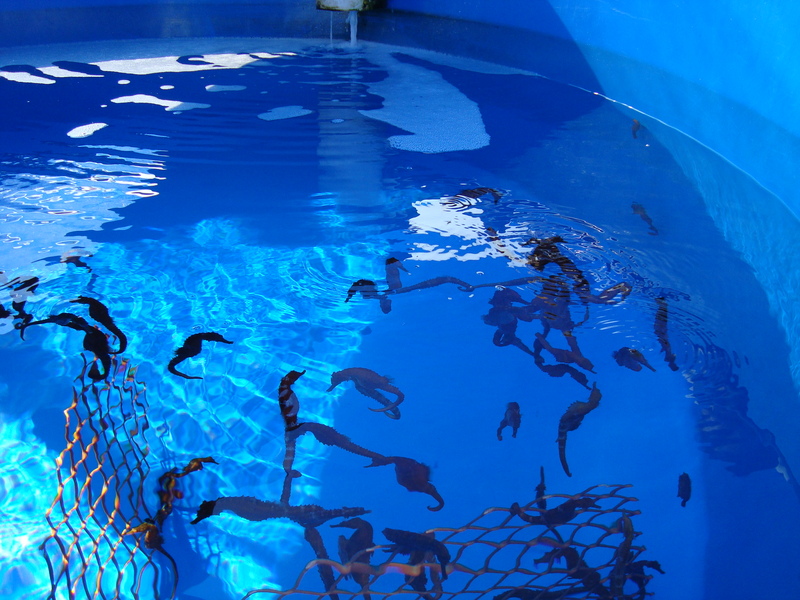 This is the only farm of its kind in North America, and they are on the cutting edge as far as breeding seahorses and other aquatic life. Our tour guide was great. I now feel very informed about seahorses – and what interesting creatures they are! It would be sad to see these little guys become extinct, and this is part of the reason that organizations like Ocean Rider are so important. They are breeding seahorses to be pets in order to avoid having seahorses taken from the wild at all. Their populations in the wild are dwindling as is, and the hope is that one day Ocean Rider may be able to re-introduce species into the wild if they do become extinct. Seahorses are in fact a fish, and they are actual predators when found in the wild – at least as far as plankton is concerned. The seahorses that Stacy and I met today have become accustomed to eating frozen versions of the food that they may have found in the ocean, but these guys were all bred in captivity. When this farm began, they had only one seahorse that would eat the food they provided. Because he liked it, they named him Mikey (as in “Mikey likes it!”). Seahorses learn by observation, so Mikey was moved from tank to tank, teaching the other seahorses that they could eat this food and survive. Eventually, young seahorses began to eat this food without question, which the biologists think is due to some sort of genetic mutation or natural selection. This meant that Mikey could retire from his job, and he now lives happily in an aquarium with the owners. Seahorses naturally mate for life when left to their own devices in the wild. This animal is one of only a few that are monogamous, but the really fascinating thing here is that, by placing their seahorses in large groups, mixing them around often, and allowing for much social interaction, the biologists at Ocean Rider have now produced swinging seahorses. A problem with pet seahorses was that if you had a pair of them and one died, you usually had only a week or two before the next would follow. Now, these seahorses will usually recover and move on, pairing with a new seahorse. Another reason that I think seahorses are highly fascinating is because they are one of only a few animals in the world that have a male pregnancy. Male seahorses have a pouch on their stomach, and when they impress a female, she squirts her eggs into his pouch. He then fertilizes them internally and carries them to term, eventually going into labour to deliver perhaps over 1000 babies. The pet industry has severely hurt the seahorse population, but another use has had an impact as well. Seahorses are thought in some types of herbology and naturopathic medicine to be a cure for everything, from sexual dysfunction to kidney ailments to joint pain and circulatory problems. This industry is incredibly damaging to the survival of seahorses in the wild as aquarium seahorses are not thought to produce the same results. At the end of the tour, I got to hold a seahorse. It was actually a much more magical experience than I expected. My seahorse’s name was Nova. We had to mimic coral and keep very still so that the seahorse would feel safe. At this point, I also want to discuss another project that Ocean Rider is currently undertaking as I think it is absolutely amazing. The organization has purchased four Leafy Sea Dragons. These animals are extremely close to extinction. They exist only in a very tiny location in Australia. These Leafy Sea Dragons reproduce interestingly as well. The female will spurt eggs onto the tail of the male Dragon, where they will stick and become fertilized. At this location in Australia, only one pregnant male Leafy Sea Dragon may be taken from the wild per year. These Dragons are incredibly popular in aquariums everywhere, so this means that they are in high demand and are in danger of continuing to exist in the wild. Ocean Rider has two males and two females. In the wild, Leafy Sea Dragons reach reproductive maturity at 4 years of age, and in the past, Dragons have often died after living only a year in captivity. Ocean Rider has a female Leafy Sea Dragon that is showing signs that she may be ready to reproduce. She has actually spurted eggs twice, but has missed the male’s tail both times, leaving the eggs to fall to the bottom of the tank, unattended. The biologists at Ocean Rider are working towards having the first successful captive breeding pair of these amazing animals. Here is a picture from the internet, if you don’t know what they look like. We weren’t allowed to take photos of the Leafy Sea Dragons we actually saw as they were quite skittish. 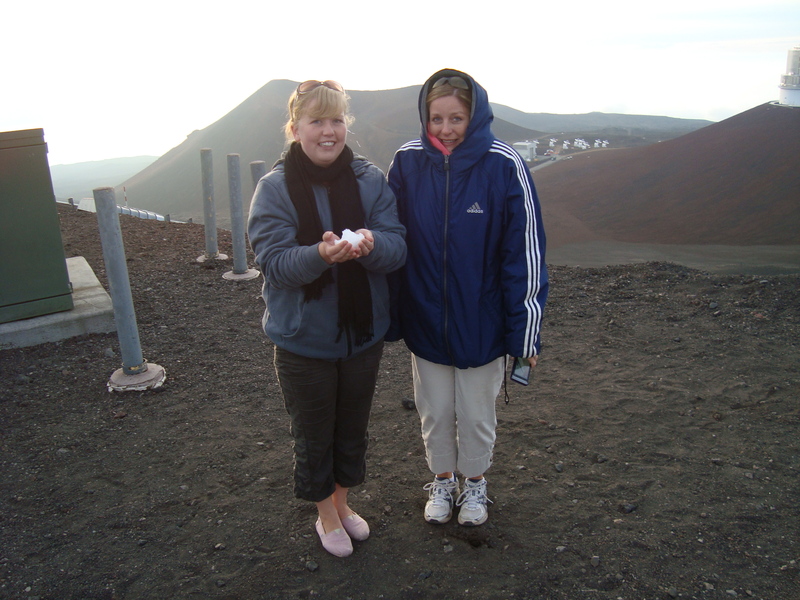 Stacy and I bought a few trinkets, left a few tips for our guide and donations to the organization, and then got back into the vehicle to head to our next stop. By this point, I was definitely feeling a caffeine withdrawal headache coming on… so it was a very happy time for us to do a coffee farm tour. This was something I had expressed an interest in doing while I was here. I mean, if you know me, you certainly must know that I am a fan of coffee. 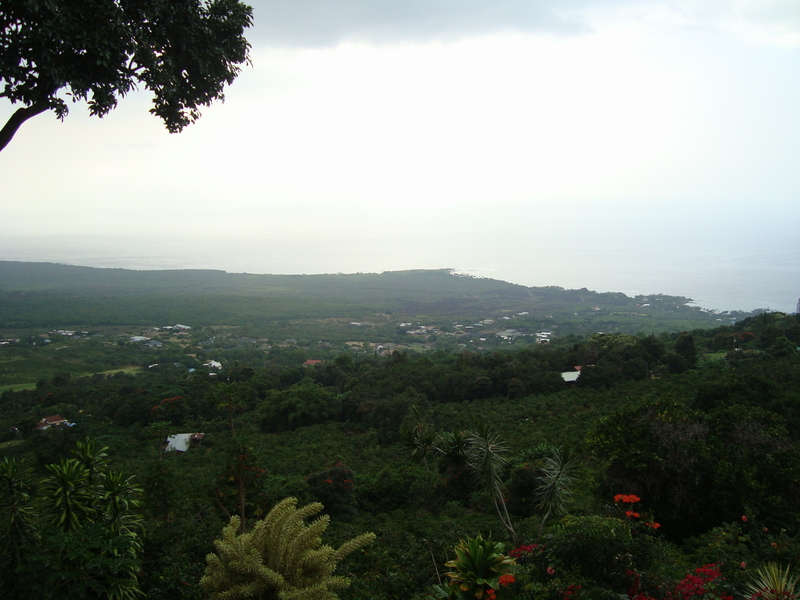 How could I be in the heart of this amazing coffee-growing area for two months without learning more about it? Stacy wanted to do the Hula Daddy tour as this is where she sends many of her guests interested in a similar experience, and she had not yet seen this farm. We arrived at an adorable country-style building, complete with clock tower. I can’t believe I completely forgot to get a picture of the building, but I did. We walked inside, and it was a modern but cozy store and office with a beautiful view. Stacy and I drank a few coffee samples while our tour guide, who is also in charge of marketing for the organization, chatted away about coffee and everything to do with it. We hit it off well with our guide, whose name was also Stacy, so we ended up enjoying an extremely leisurely and informative tour. 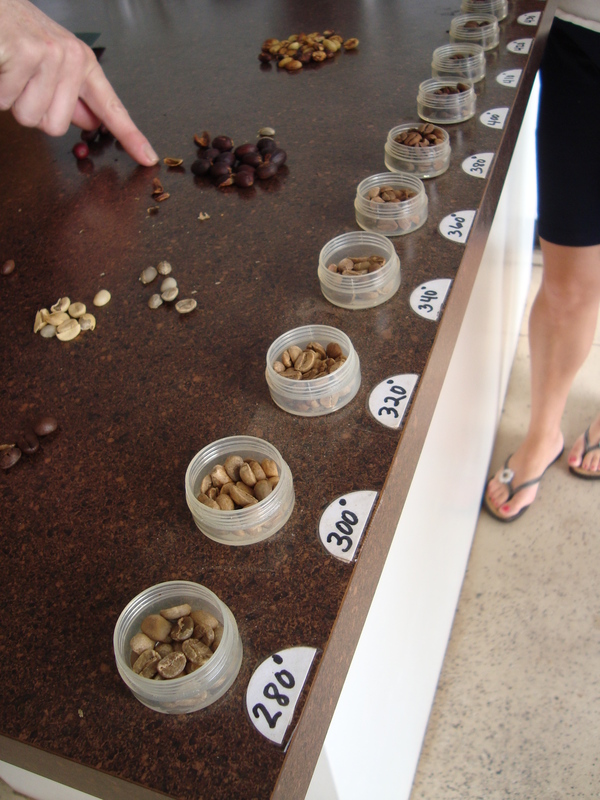 We walked down to the coffee plants and tasted coffee cherry, then went to the roasting room to watch as one lady had the job of roasting, taste testing, and packaging every single bag of Hula Daddy Coffee. Hula Daddy is a boutique coffee farm in that they specialize in putting out an amazing product, but not necessarily mass producing it. 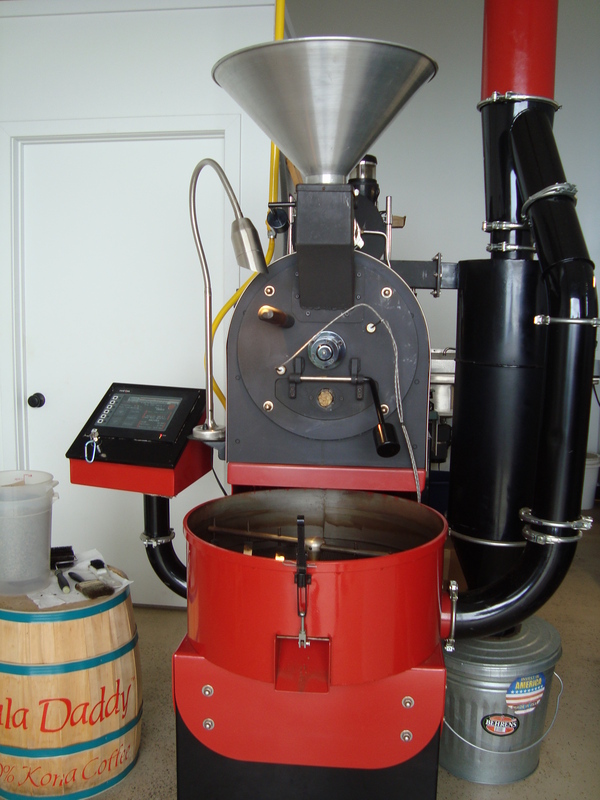 The focus is on putting out the best product that they possibly can, and that has paid off – a few Hula Daddy coffees are among some of the the highest rated in the world. The Hula Daddy “Kona Sweet” is rated as a 97, which is extremely high on the coffee rating scale, for those of you that have no idea what this means. In fact, no coffee in the world has been given higher than 97, and there are only a handful that have achieved this rating. 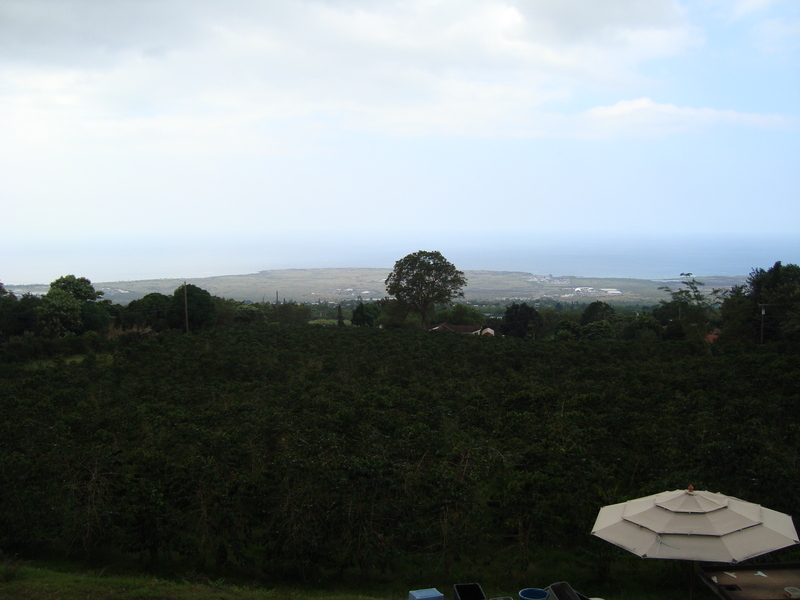 On the Big Island, the coffee growing season runs from February to July, and the harvest goes from August to January. For those of you that know anything about farming, a 6 month long harvest is ridiculous! They have pickers at work every single day during the harvest season. Hula Daddy does things differently from many coffee farms in that they actually hand sort the coffee cherry after it is picked. 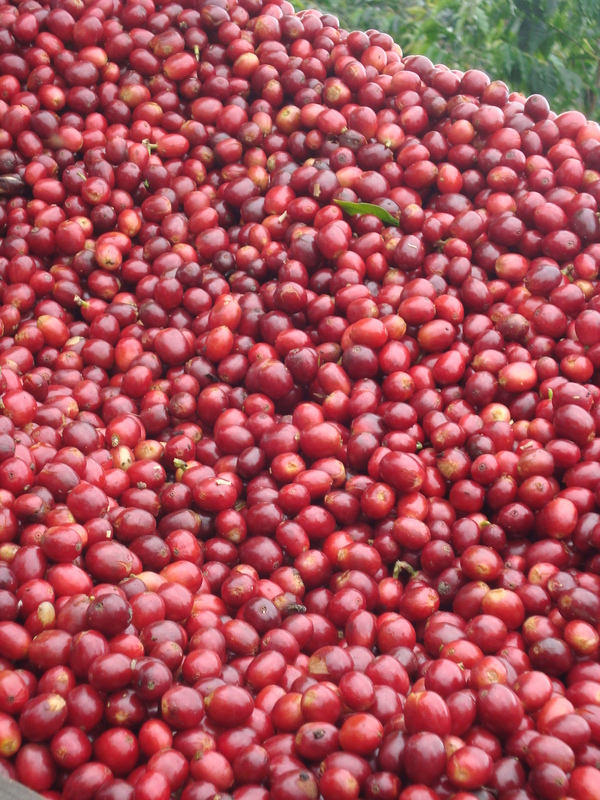 Any cherry that is over-ripe or under-ripe is discarded and actually sold to another company. 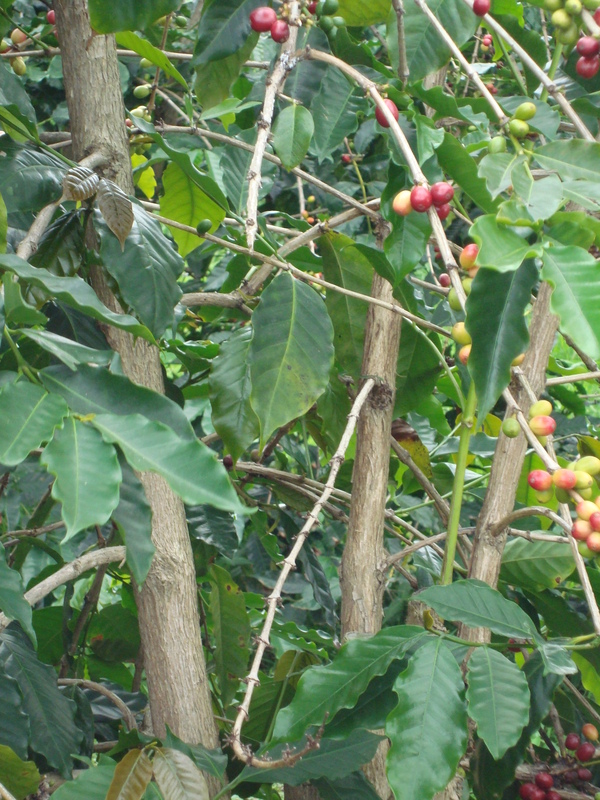 The defective cherry is still 100% Kona coffee, it just isn’t necessarily something Hula Daddy would put their name on. 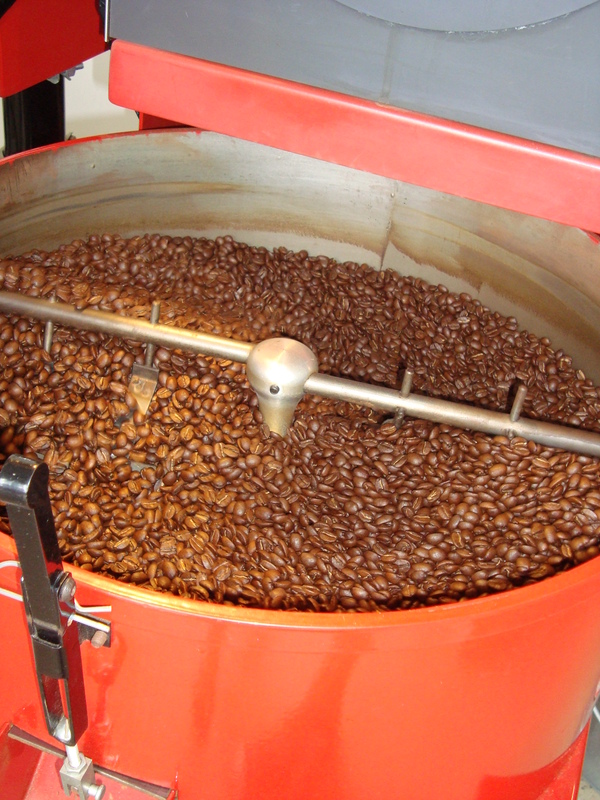 This means that every Hula Daddy coffee bean is roasted evenly and to perfection. Beans roasted to different levels. We watched a batch roasted to 420 degrees. 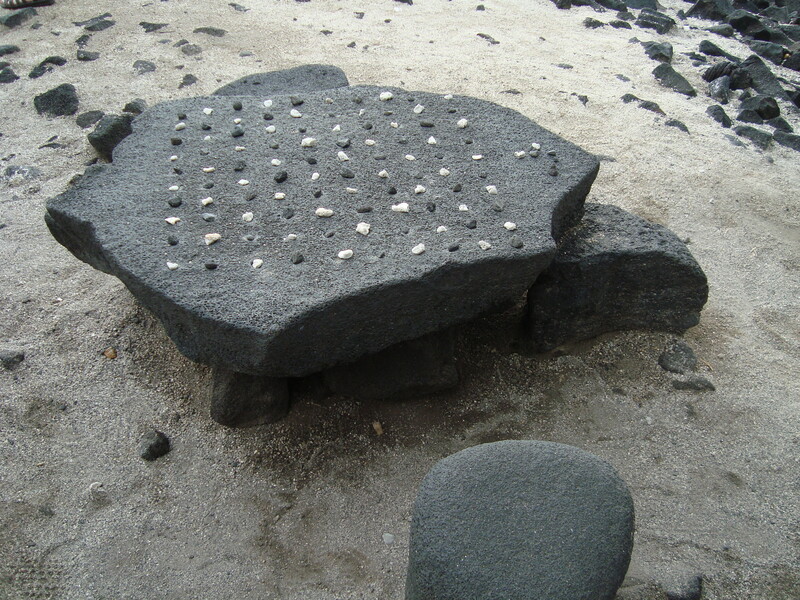 Kanane – A game the ancient Hawaiians used to play. 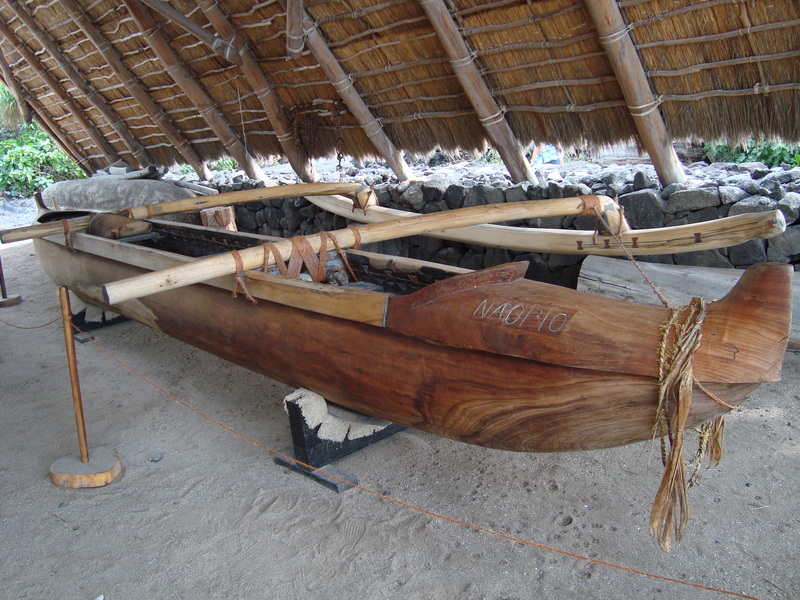 The royal canoe landing… if a commoner set foot here, the penalty was death! 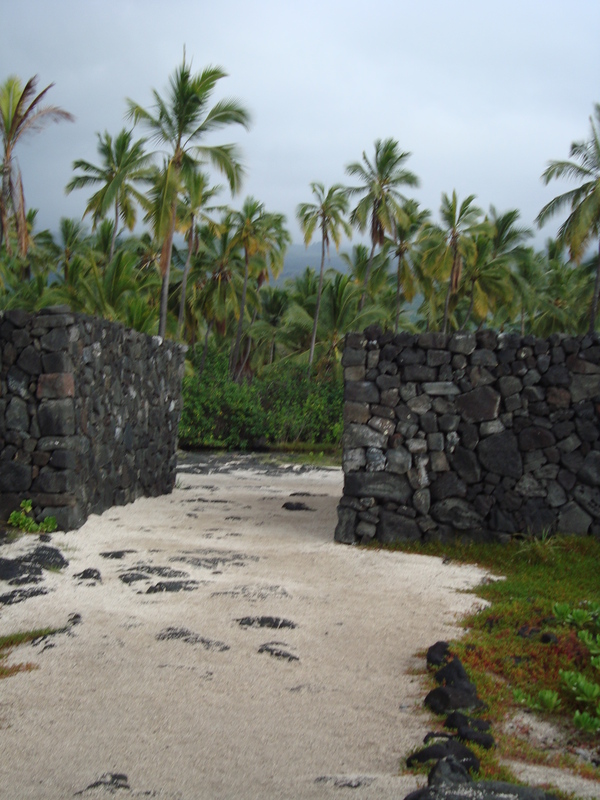 The wall surrounding the Place of Refuge – it didn’t have a pathway through it when this area was in use. Warriors would stand on top of the wall to protect the area. After we were finished wandering around the Place of Refuge, we went to a popular snorkelling spot near there and got into the water. Despite the fact that it was “cold” out (Stacy’s word, not mine), it was lovely in the water. There were lots of fish and the water was quite warm, especially around all the coral. This was a beautiful spot to snorkel. 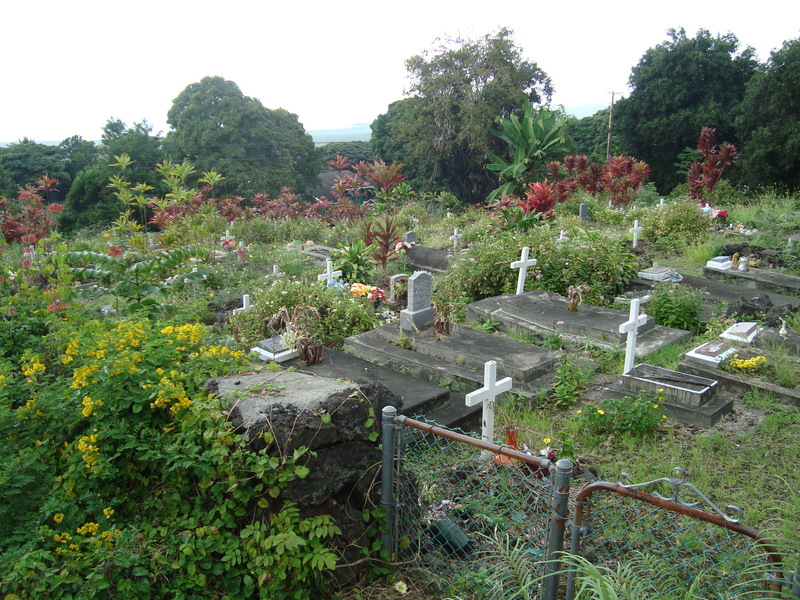 Here is a view of the Place of Refuge from this area. 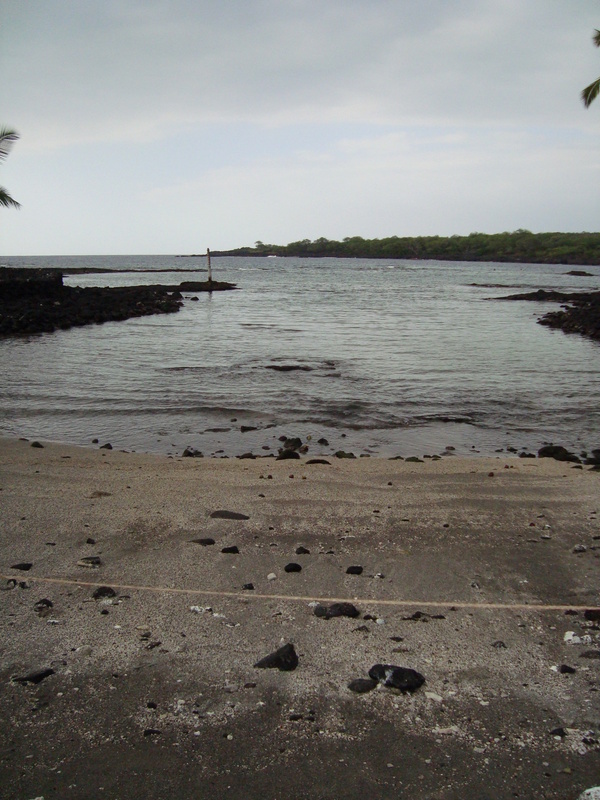 After we were done in the water, we got back into the car and made a stop on Ali’i Drive for a drink on the way home. This was the view we were treated to at the bar. What a way to end the day! There were so many amazing things about today, but I think my favourite part of it all was how very educational it all was – and I love how much I was able to regurgitate in this blog post! I learned so many interesting things and heard so many captivating stories that I am happy I was able to share at least some of this knowledge with all of you. I have just a week left here in Hawaii, so Stacy and I have a ton of activities planned for the next little while. It helps that she is off work as well! I’m excited about all the cool activities I will get to cross off my “To-Do” list in the next bit, but I think it’s going to be hard to say goodbye to Hawaii. The last couple days have been fairly mellow. On Friday I drove Stacy to work and had her vehicle for the day. I spent a bit of time shopping at Target in Kona, mostly just to buy a suitcase to haul all my Christmas presents back in. As it was Black Friday, shopping was just a little bit intimidating after all the bad press that this crazy day gets – there were even police officers roaming the store! 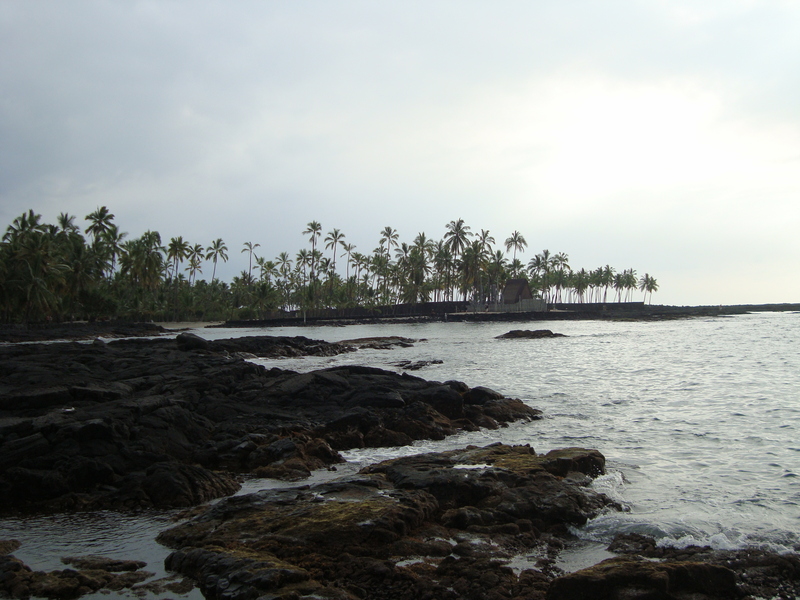 On the way back to the Kohala Coast, I stopped at the Kaloko-Honokohau Park and snapped a few photos of all the surrounding lava rock. 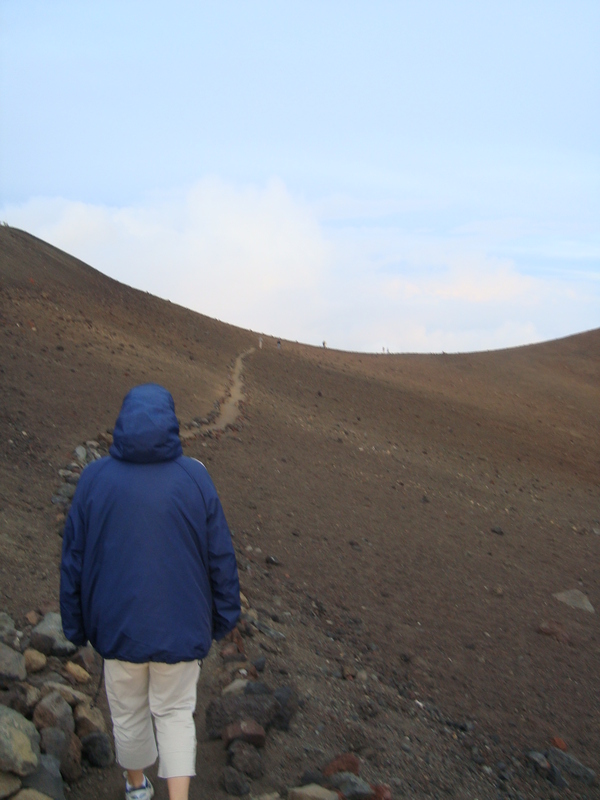 I wish I had hiking gear with me… I would’ve loved to have wandered around there. As it was, I soon hopped back into the vehicle and decided to head to Starbucks at the Queen’s Shops with my laptop to wait for Stacy to be done work. I had a productive afternoon there, and ended up being able to meet Stacy a little bit early so that I could see the floor she manages at the hotel. It took a bit longer than usual for her to get out of there as this was her last day of work before her vacation. I spent pretty much the entire evening practicing my guitar. I’ve come to the realization that I only have a week of instruction left, and I’m on my own after that. I’m really hoping to be at a somewhat self-sufficient point by the time I leave here. Leilani’s friend Lola and her mom Leah were over that evening. They were actually the ones that connected me with my guitar instructor as Lola takes lessons from him as well. She and I spent a bit of time talking about guitar and teaching each other. On Saturday Stacy and I took the kids in to Kona early for gymnastics, but it turned out that class was cancelled. We went shopping instead, hit up a park for the kids for a bit, and met Leah and Lola at a Thai place for lunch. 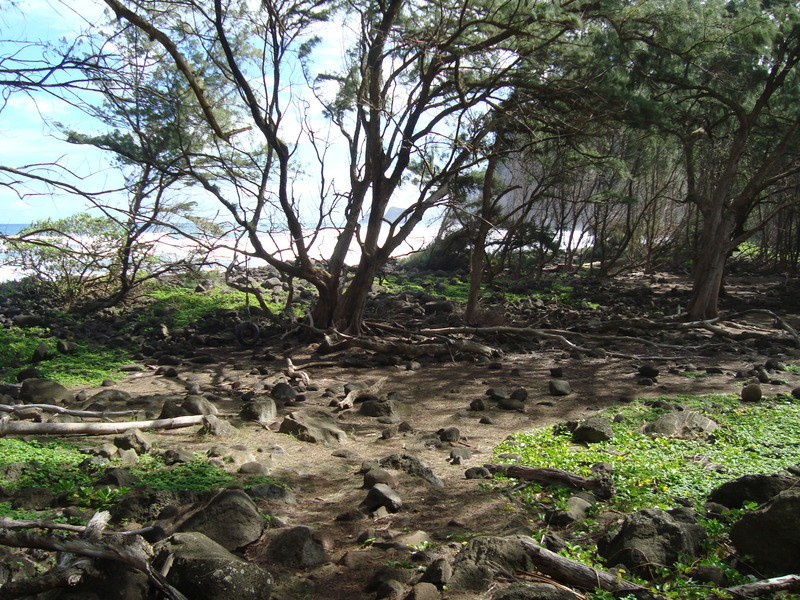 We had originally talked about heading to Makalawena Beach that afternoon, which you need to off-road into, but it turned out that it was far too windy and just not an ideal day to do that, so we have postponed that trip to next weekend. 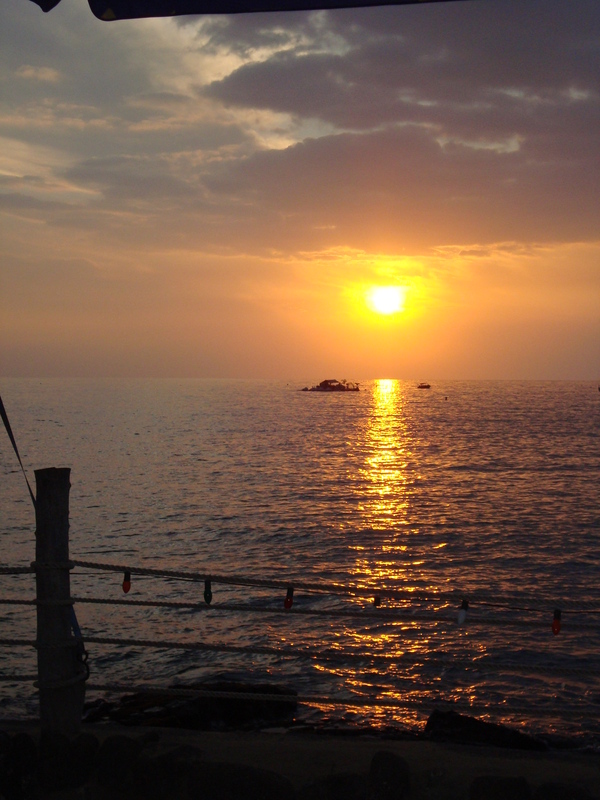 Instead, we spent the day at the pier in Kona. We relaxed on the beach, rented a paddle board from a charming beach boy, and got in the way of a wedding . Well… we didn’t really get in the way, we were politely “asked” to move, as the organizer was not really able to tell us to leave a public beach. We moved over a few feet to (hopefully) make our way out of the happy couple’s wedding album. 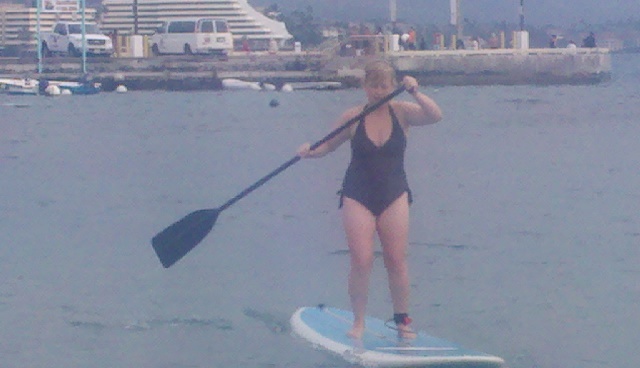 I got to play around with stand-up paddling for the first time. I got a quick lesson from the guy running the rental shack, and away I went. We all took turns on the board – I really enjoyed it. Stacy was the only one, along with a couple of the kids, that flipped the board. I didn’t go far out into the ocean. I mostly stayed close, but every once in awhile would make my way around the corner and into the waves, then promptly get scared and turn back around to ride the waves in. I hope we do get to make our way to Makalawena Beach next week, but this turned out to be a perfect way to spend the afternoon. Today I celebrated my very first American Thanksgiving. 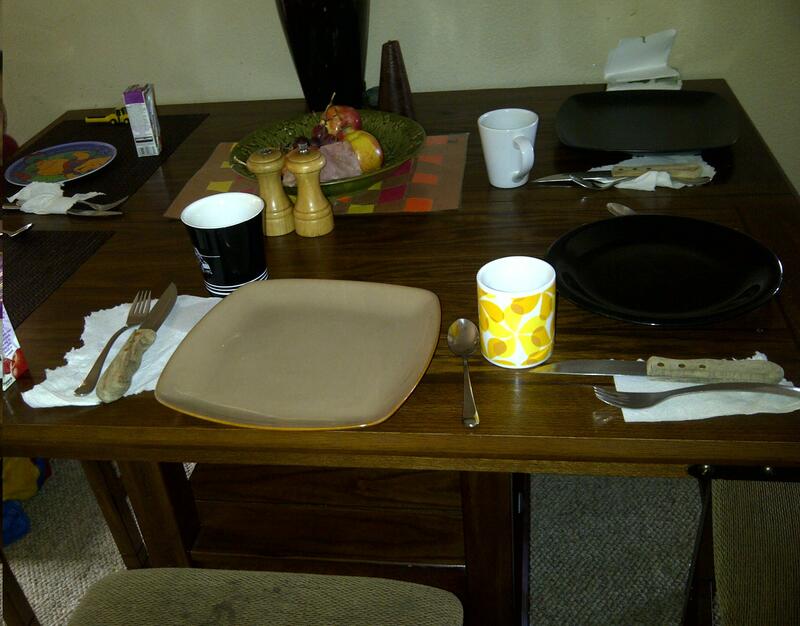 I woke this morning to find that Lei and La’a had prepared a breakfast feast for the family. They had laid all our places and set fruit on the table, as well as some lunch meat (because you need to have some kind of meat at Thanksgiving). It was adorable. That evening, the whole family attended a dinner at a neighbour’s house, which much of the neighbourhood was invited to. It was a lot of fun, even though my timeline feels completely off right now. I am glad that I was able to stay here in Hawaii long enough to celebrate this holiday, as I was here for the Canadian version and therefore missed out. Why is it that Canada and the US celebrate Thanksgiving at different times? We had a delicious dinner with a bunch of amazing people, and rounded out the evening with some musical entertainment. I was even pursuaded to play my extremely basic version of Wonderwall on the guitar, accompanied by a much more accomplished musician on a baritone ukelele. Our gathering had a great feeling of companionship, and we all just enjoyed each other’s company. I am thankful for many things in my life. I am thankful for my health and my happiness. I am thankful that I had the means to obtain a university degree, and to better myself along the way. I am thankful for my family and friends – all the amazing people in my life make it special. I am thankful that I was able to come and spend this time in Hawaii, and to get to know my young cousins and my Hawaiian family. I am thankful to have so many places that my life exists in – I always felt that was difficult, but now I realize that it just means I have more than one place that I call home, and isn’t that special? 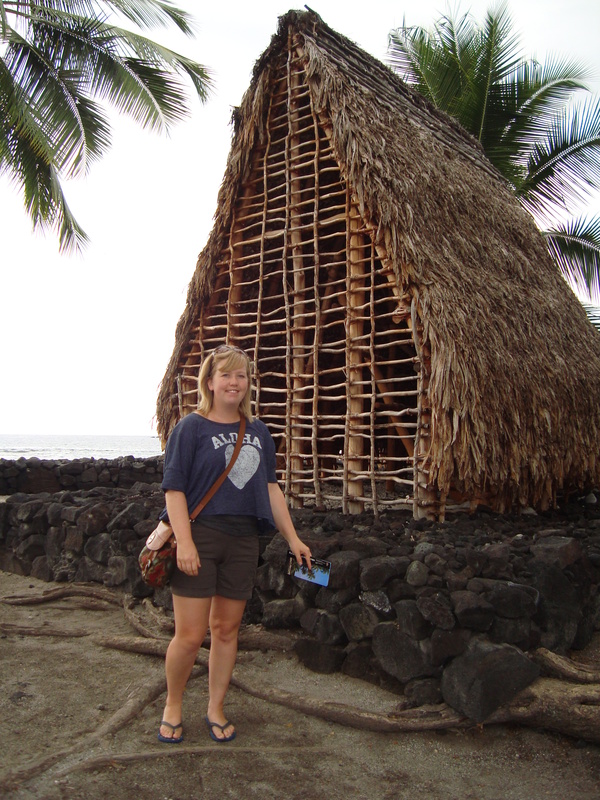 On Saturday I joined Stacy and the kids, just running a bunch of errands in Kona. We hit up Kmart, Macy’s, Target, and Costco. Pretty productive afternoon, if I do say so myself. That evening we laid out some pupus (appetizers), pulled out a few drinks, and had some people over. It was a nice evening, and the kids had a blast running around and playing. On Sunday we had struck up a bit of a group to hit the beach together. We went to 69 again. Leilani immediately found a rope swing to play on and spent most of the afternoon there. I went out to do some snorkeling with Sean and we saw a few squid! 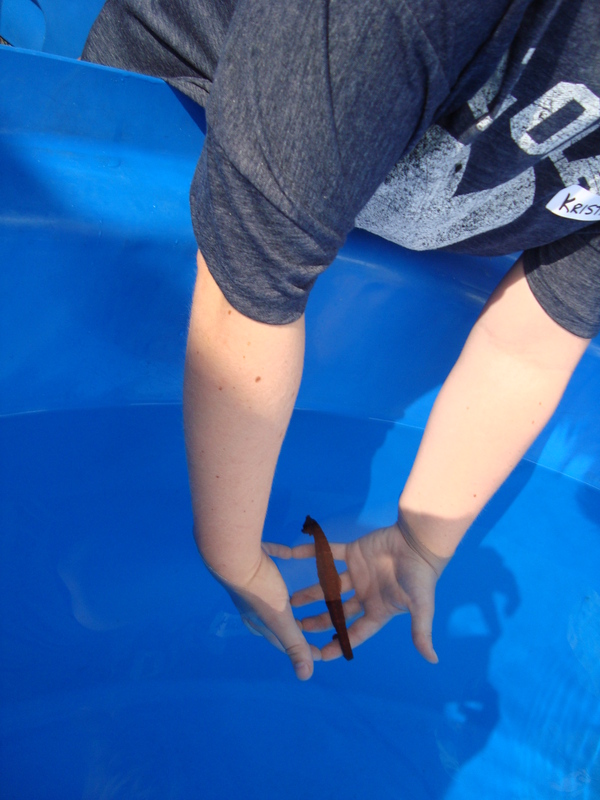 He said that he has never seen squid in water that shallow, so that was kinda neat. I spent the majority of the day reading and relaxing in the sunshine. That evening, when we got home, Stacy and I looked outside at the bunny cage to find Smoky (Daddy Bunny) hanging out all alone outside the cage that his whole family was in, looking incredibly pathetic. Some (but not all) literature Stacy had read in the past had said that he may harm the bunnies when they are little, so not to keep them together. He just looked so sad and lonely, though, that we decided to do a test run of having him in the cage. Not to mention, the babies are getting a little older now, so we figured it would probably be fine. Stacy slowly walked over to him, and he didn’t make much of an effort to get away, so a few minutes later he was inside. It wasn’t long before they were all hanging out together. Smoky was cleaning one of the babies, and they were all cuddled together on the top level of the cage looking all happy and family-like. Adorable. The next day, I woke in the morning and did some work on my blog. Sean took La’a and went to Waimea, so I was at the house alone. Now, if you know me, you probably know about my irrational fear of spiders. I’ve done pretty well on this trip so far avoiding them, except for a couple cases, but nothing horrible. I went into the kitchen to make some coffee, and as I was leaving, something caught my eye on the floor. It was a huge spider, lurking underneath the counter. I had never seen one that big before, and it looked kinda reddish. I went back to my computer, sat down, and brainstormed ways to kill it. It was huge, and a little bit reddish. Could it be poisonous? I looked around for something long to squish it with, but then got scared when thinking about the fact that if I missed, it could climb along whatever implement I came up with, and come right at me. I thought more about ways to squish it that didn’t involve me being attached to the other end of the squishing object, but then thought about how quickly little spiders move and realized I had no desire to see how quickly a big spider could move. I didn’t get close to it… I just looked at it from a distance and couldn’t bring myself to do anything else about it. I had a nice day in Kona. I loitered for awhile at the Starbucks in Target, then went to Costco to pick up a couple Christmas surprises Stacy wanted to get for the kids. I spent a couple hours wandering the Kona International Market, shopping for a few more gifts and souvenirs. 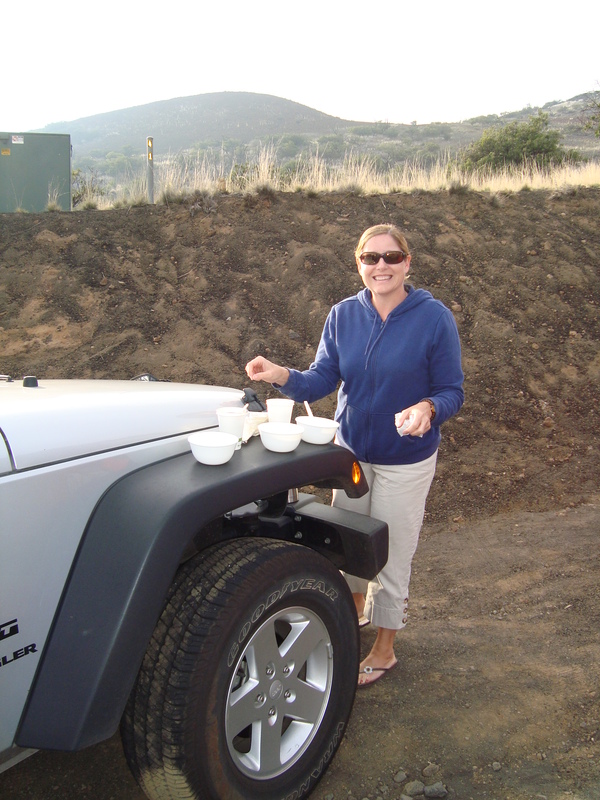 By the time I was ready to head back to Waikoloa, Stacy still wouldn’t be home from work and I was too scared to confront the horrible spider by myself, so I decided to stop at the Queen’s Shops at Waikoloa Beach and loiter at the Starbucks there. I spent a couple hours catching up on emails and blog posts, and made it back home around 6:30. “No sign of a terrifying spider?” I asked hesitantly as I walked in the door. I wasn’t sure what response I wanted – that Stacy had seen it, or that she hadn’t. Slowly I got comfortable being in the house again, despite my earlier episode. Finally I walked into the kitchen, looked over, and the spider was still exactly where it was when I had left that morning! I pointed it out to Stacy, and she picked it up and laughed at me. 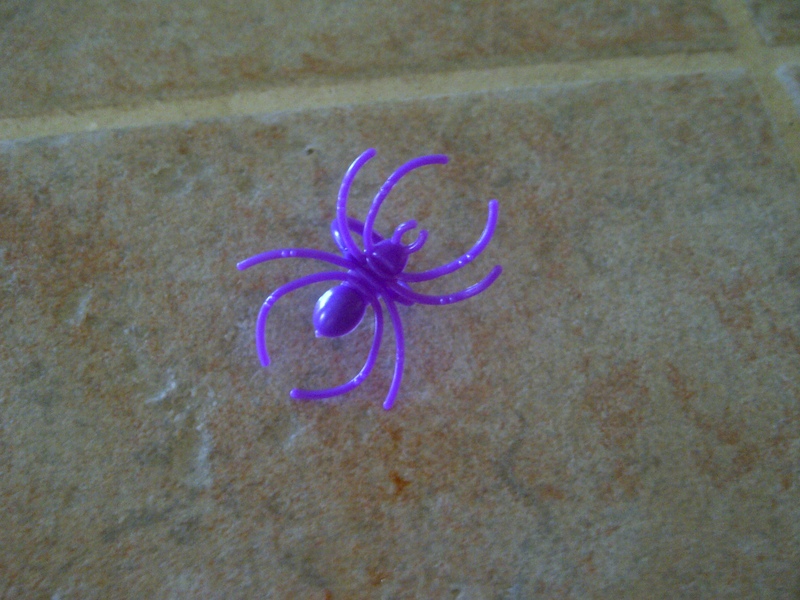 Apparently my horrible spider was nothing but a toy spider ring. Stacy threatened to share this story with everyone she could possibly get in touch with, so I figured I may as well do so myself and laugh at how ridiculous I am when it comes to spiders. I also think that in exchange, I get to share a small story about Stacy that I had previously left out of my posts… I’ll think about it and perhaps insert it in a later post.